Last night your correspondent gave up on the BBC hysteria of Mssrs Webb and Peston, and instead surfed the US News channels. He wanted to find out what's really going on with US Treasury Secretary Paulson's $700bn TARP (Troubled Asset Relief Program). Unfortunately, what he actually saw was enough political grandstanding to bring on one of his dizzy spells. 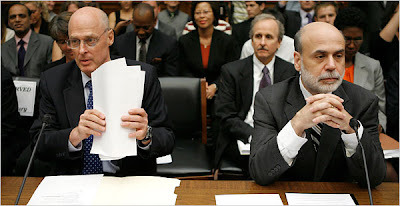 To start with, members of the Congressional Committee grilling Paulson and Bernake on live TV seemed concerned mainly with mouthing off for their constituents back home - long written statements followed by the weakest kind of underarm deliveries imaginable. They made our own Public Accounts Committee look like a lion's den in comparison. Then one of the Washington TV pundits explained that the actual deal had already been done with Congressional leaders behind closed doors in one of their smokefree rooms. The Committee hearing was simply so Representatives could cover their own backs with voters: "we had to pass it because the Administration told us the world would collapse if we didn't - you heard them!" Suddenly Senator McCain popped up in front of two US flags to announce he was putting his campaign on hold so he could personally supervise events back in Washington. He looked rather old and a little desperate. Shortly afterwards Senator Obama appeared in front of another two US flags to say he was not putting his campaign on hold, and that McCain shouldn't have rushed out to grandstand for TV. Even though he himself seemed to be doing precisely the same thing. We can only thank God we're not US taxpayers. The bankers have apparently panicked and blagged their way into a $700bn get-out-of-jail-free card. OK, they're not quite getting out free - bank shareholders have already taken a serious whack, and banks will face much heavier regulation from here on. But being able to offload their toxic debt assets onto taxpayers is one huge weight lifted from their shoulders. Why on earth should taxpayers accept that? What precisely is our government planning to do when another of our banks comes begging? Given the Crock fiasco, do they now have a plan? How will they ensure that any further bailouts are accompanied by bank shareholders being "crammed down" (which of course did eventually happen with the Crock, but only at the cost of full nationalisation).